To view on your mobile device or tablet, click here. On Thanksgiving Eve, the AHS Girls Soccer team prepared dinners to distribute on Thanksgiving morning to families who are still affected by the gas crisis. All supplies and food were generously provided by an anonymous donor. Boston 25 News caught up with the team at Temple Emanuel’s kitchen. 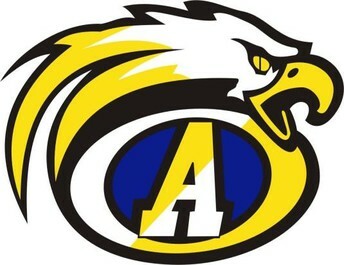 AHS senior Ethan Coyle is determined to get as much as possible from his high school experience. Excelling in academics and athletics, Ethan balances school work and sports while also giving back to the community. The weekend before Thanksgiving, he was delivering pies for a fundraiser and leading a blanket drive for people affected by the gas explosions. Ethan is a three sport athlete, and a three sport captain! In the fall, he plays on the football team as a two way starter, wrestles in the winter, and captains the track team in the spring. Football is a big part of Ethan’s life, and he hopes to be recruited for college football. As much as Ethan is focused on athletics, he is also passionate about math and economics and wants to pursue a STEM related major. He’s looking to study at Williams College or Massachusetts Institute of Technology (MIT), and has received numerous accolades for academics. 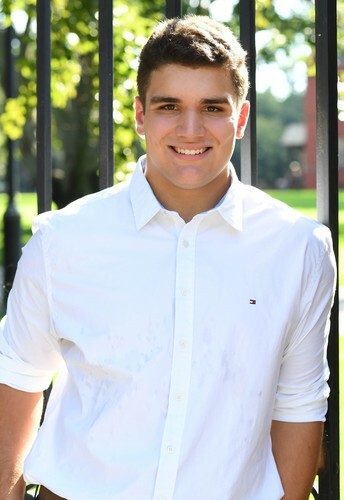 He is a member of the National Honor Society, a semifinalist for the 2019 National Merit Scholarship Program, recently won a scholarship for athlete-scholars from Commonwealth Motors and was honored as the state winner of the 2018 Wendy’s High School Heisman Scholarship. 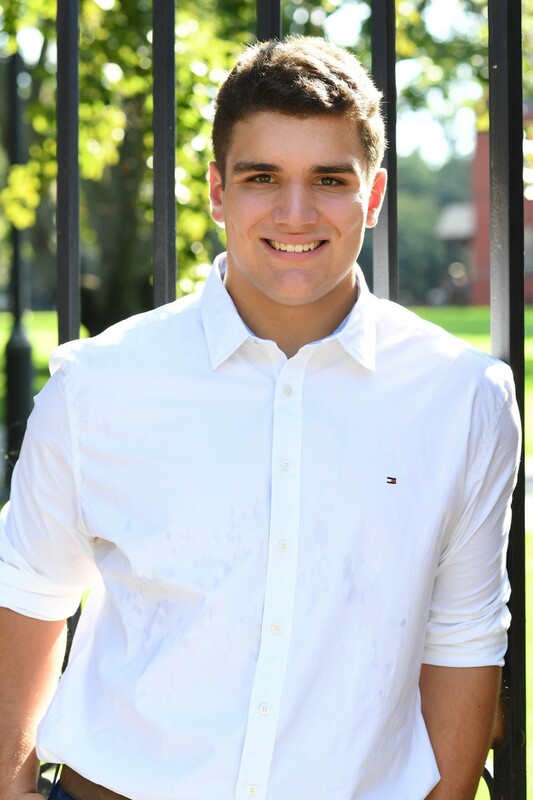 Ethan helps mentor younger students at the PALS Program at Phillips Andover, which provides academic enrichment, study skills, and learning strategies for Lawrence middle school students and assists them with the high school application process. The program works in two parts, a yearlong mentorship and an intensive summer program. For Ethan, participating in all these activities takes balance. It’s also very rewarding and he credits his family, teachers and coaches for keeping him grounded. His advice for getting the best out of high school? Keep moving, and don’t be afraid to try as many experiences as possible. "All Glory comes From Daring to Begin." While it might not be an original Marilyn Fitzgerald quote, it certainly gives a glimpse into her philosophy as a coach of almost 50 years. The Girls Swim and Dive coach has collected pages of quotes over her 27 years at AHS, and each season begins with this one. 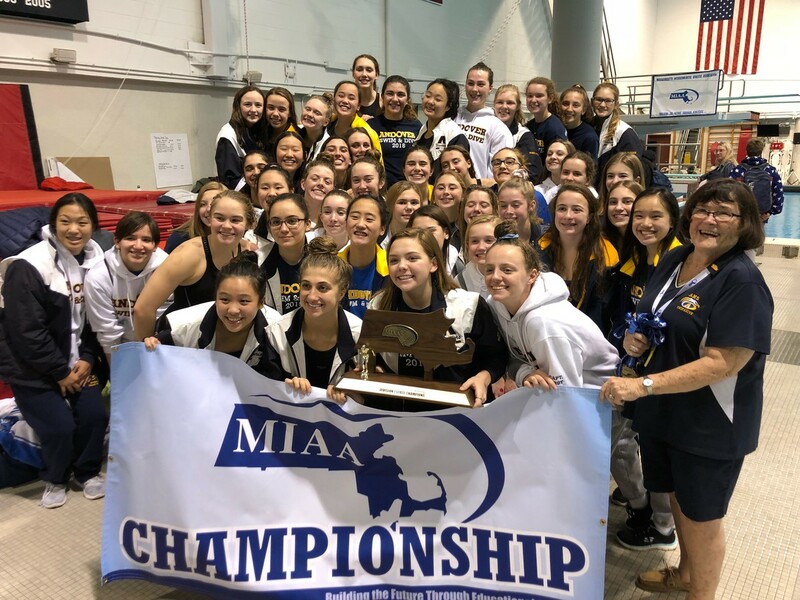 A few weeks after the Girls Swim and Dive team took home their 5th consecutive MIAA Division 1 title, Marilyn reflects on a successful year, in the pool and out. A three time cancer survivor, Marilyn says this has been a healthy year; she’s grateful and not looking back at her health challenges. 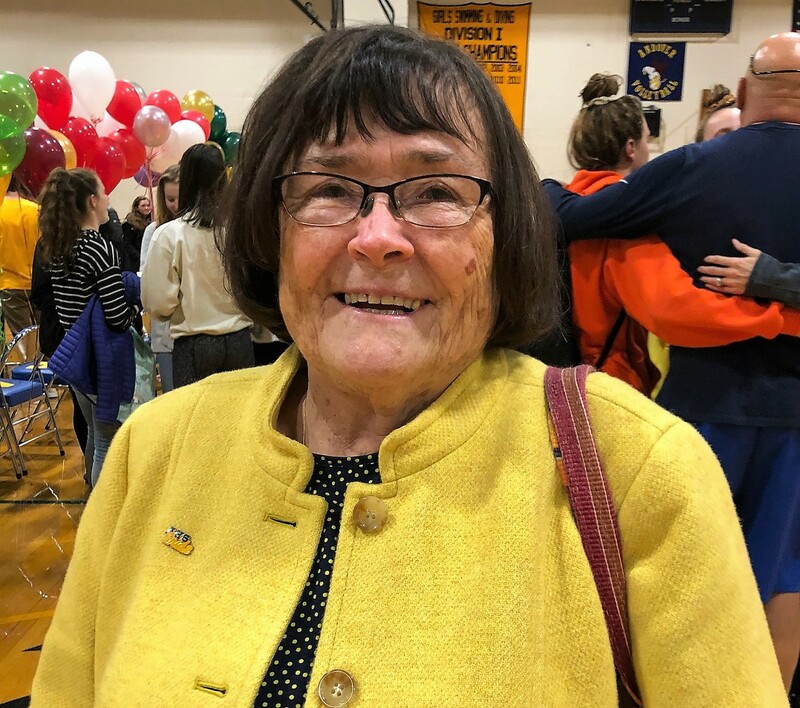 Marilyn has created such a dynasty, the Eagle Tribune changed the name of the Swim Coach of the Year Award to the Marilyn Fitzgerald Award in 2014. She’d won it a record eight times by that point, and has added a few more to her mantle since then. Marilyn graduated from Andover High in the 1960’s, which was then located in the now West Middle School. Back then, high schools didn’t offer a varsity sport for women. AHS had an all-girls marching band and the all-girls varsity club, which Marilyn says still didn’t get you a varsity letter. The only way for a woman to get a varsity letter was to be a cheerleader. Marilyn wanted that letter, so she became a cheerleader. Her love of swimming comes from her time at her parents’ lake house, and time in the water is all about doing laps. 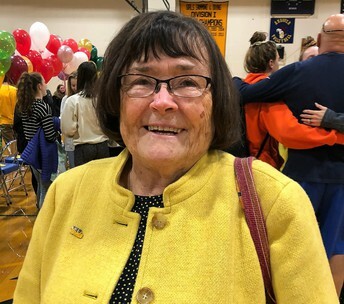 Marilyn became a lifeguard and swim instructor at the Lawrence YWCA in 1970, at the urging of her lifelong friend, Carol Dowd Boileau who was the original coach of the AHS Girls Swim and Dive team. The girls on her team know they need to train in any competitive stroke, from freestyle, backstroke, breaststroke and the ever-difficult butterfly. Marilyn trains the team to be independent and motivates them as if they were her own daughters. Her goals aren’t just about competition, but making sure the girls are able to think for themselves and become problem solvers. Her coaching style is clearly working; the team has won 18 out of the last 19 state championships. When a team member discovers she can do something she didn’t think she could, that’s when Marilyn is most proud. It is inevitable that winter will make an appearance in the next few months, and I wanted to take a moment to review our communications for parents, staff and students when the forecast calls for inclement weather. While the preference is to keep schools open, our first priority is the safety of our students, bus drivers, and staff. In order to plan appropriately, I am in touch with Chris Cronin, Marc Fournier and our dedicated DPW team, who do a terrific job in difficult circumstances, for their guidance on road conditions. Through our collaboration, and in consultation with weather forecast services, we may cancel or delay schools. Typically, these decisions are made in the early morning hours, and communicated through a variety of ways. APS will send notice out via email, text, voice recording, and will post on Twitter and our website under “District News.” We also alert local Boston media with these details. We ask that you not contact the police or fire departments requesting this information, as these lines are for emergencies only. 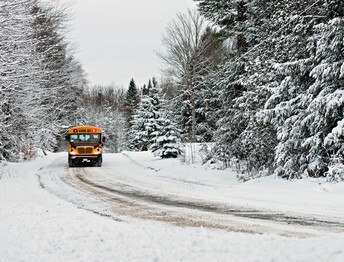 On some occasions, road and traffic conditions might warrant a one- or two-hour delayed start time, which will be announced in the same manner as if school is closed. In the case of a one hour delay, morning (AM) preschool and kindergarten will not be cancelled. A two hour delayed start time does cancel morning (AM) preschool and kindergarten. All other schools, including full-day kindergarten and preschool, will begin 2 hours later. If your child takes the bus, it will arrive two hours later than a typical school day. After any delayed opening, schools will be dismissed at their regular times. Because each storm is different, the specifics on closings and after-school activities will also change with the forecast. While our preference is for a mild winter, it’s not always the case in New England and I hope this information provides some clarity. The Fall Gala is Here! Join us on Thursday, November 29 at 7:00 pm for the Andover Vocal Music Fall Gala at the Collins Center. All of the vocal ensembles at the middle and high school levels have been hard at work since the beginning of the school year. They invite to you hear what they have been working on! 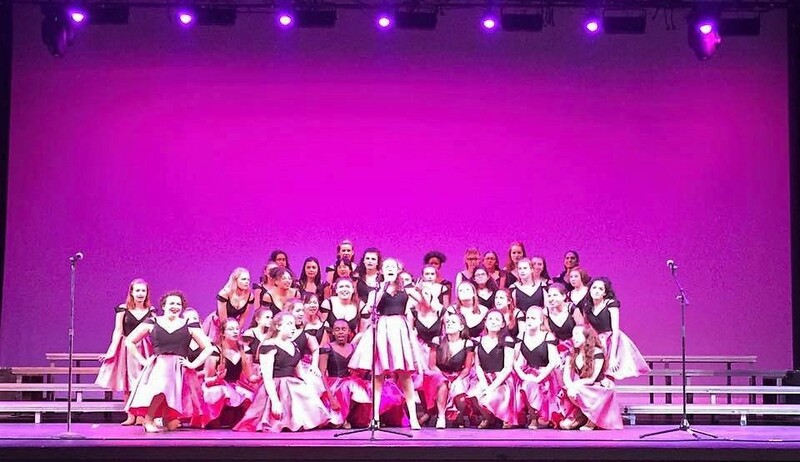 The gala will feature all three middle school choirs, AHS Concert Choir, Spotlight (high school chamber choir), Chromatics (a cappella), Nothing But Treble (women’s show choir), Back to BASS-ics (men’s show choir) and From Start to Finish (coed show choir). The concert will conclude with a combined number featuring all of the performers! 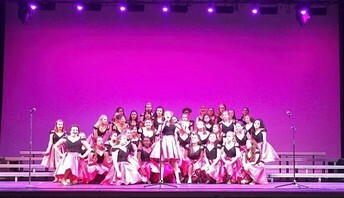 The choirs are under the direction of Katie Bickford, Jennifer Bobzin, Chris Desjardins and Lori Pratt with choreography by Beth Kennedy and Darvin Hernandez. This event is free! 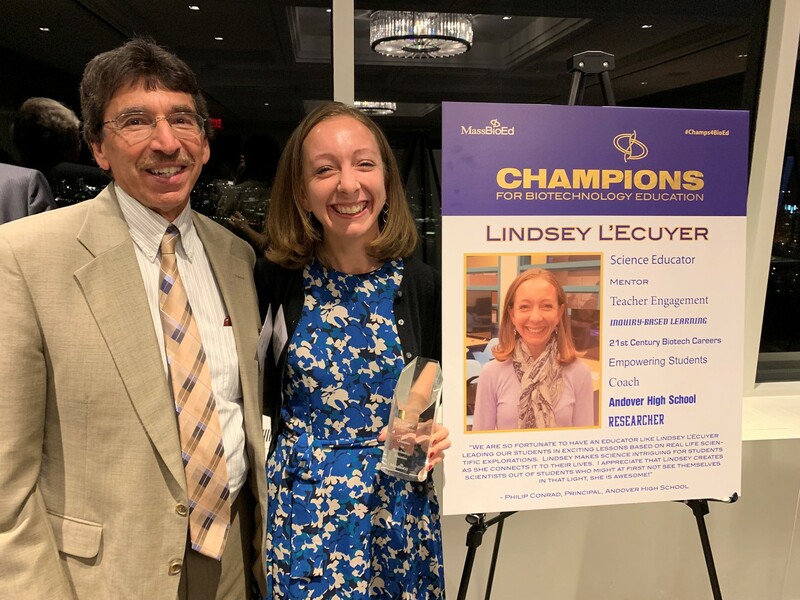 Lindsey L’Ecuyer is the proud recipient of the 2018 “Champions for Biotechnology Educators’ Award” by the Massachusetts Biotechnology Education Foundation (MassBioEd). An 11 year veteran of the classroom, Lindsey has been teaching Biology, Biotech, Forensics and Bioethics for five years at Andover High School. MassBioEd is a non-profit organization that strives to build a sustainable life sciences workforce through educational programs that inspire and propel students, engage and excite teachers, and illuminate the pathway from the classroom to careers. Lindsey was surprised at the awards ceremony by her middle school science teacher and mentor, Rino Beninati. Rino has made an incredible impact on Lindsey, and presented her with her award on Tuesday, November 27th. Congratulations Lindsey! The October/November issue of Scholastic Art magazine features work by AHS art students Livia Iwanicki, Rocco Padova, and Imani Physic. They participated in a lesson entitled "Design Your Dream Shoe" as part of their Drawing course in Spring 2018. The lesson plan was created by Visual Arts faculty member, Meghan Michaud. Each student chose a different activity to base a custom shoe design with consideration to the specific activity. 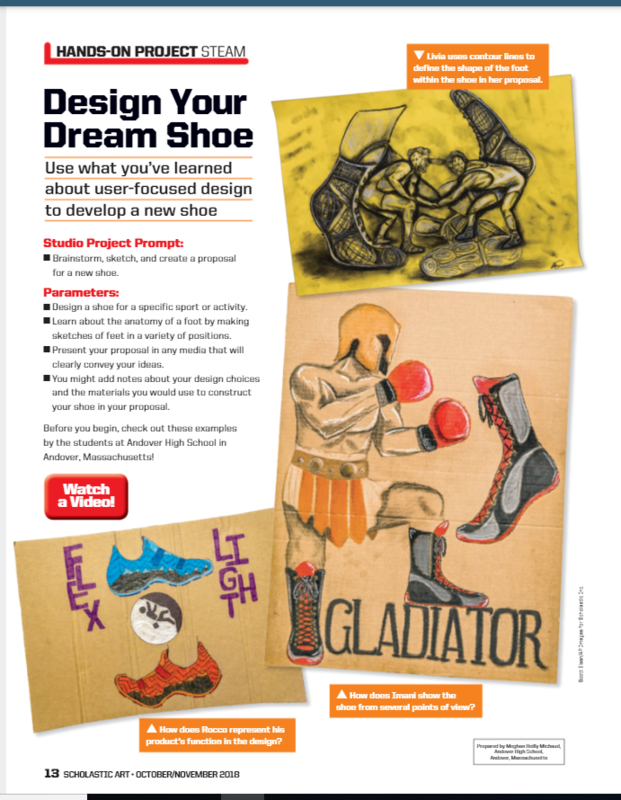 Students studied the form of the human foot, movement, materials, and footwear design as part of their study in this unit. 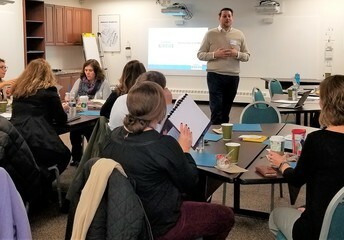 APS hosted Billerica and Foxboro public schools this week for the third Global Learning Network professional development workshop in the past two years. These workshops are presented by David Bramlett, senior director for America Achieves, and focuses on increasing student motivation for learning math and science. The mission of America Achieves Global Learning Network is to help schools around the globe better prepare students to succeed in a rapidly changing world. The Global Learning Network recruits and brings together education leaders from schools that are World-Leading Learners – from the U.S. and abroad – to share insights, resources, and best practices for continually improving student success and education in schools so students are prepared for career and lifelong success. 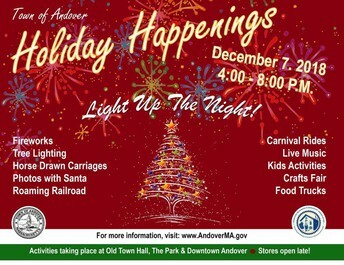 Andover will celebrate its annual Holiday Happenings event on Friday, Dec. 7 from 4-8 p.m. The event will feature a variety of activities, including photos with Santa, carnival and train rides, shopping, dining, fireworks and more. 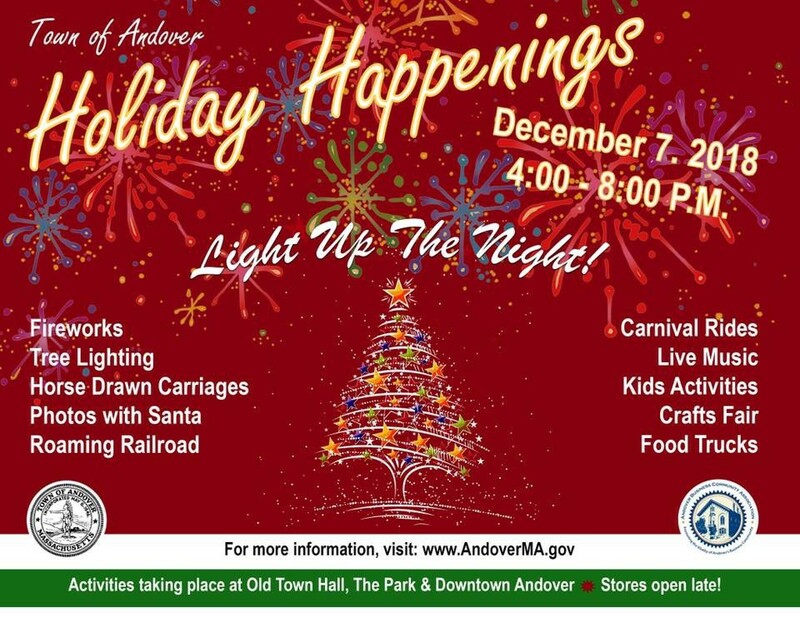 The event will be held across a variety of locations throughout town, including Old Town Hall, Memorial Hall Library, Andover Historical Society, Center at Punchard and the park at Chestnut and Bartlet Street. For more information; click here.